What's Up With Major Fashion Brands Stealing From Independent Artists? Artists are being ripped off, and there's not much they can do about it. 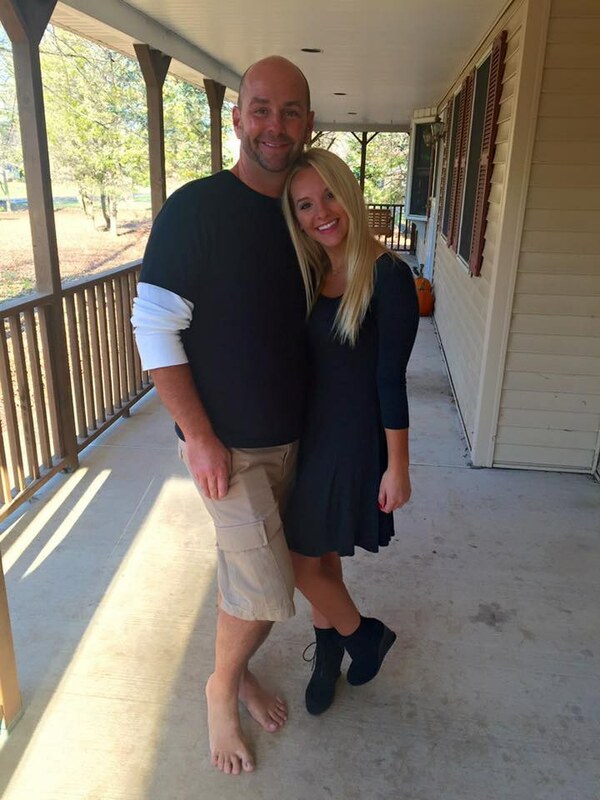 a claim she proved in an Instagram post that showed her designs in a side-by-side comparison with the company’s. 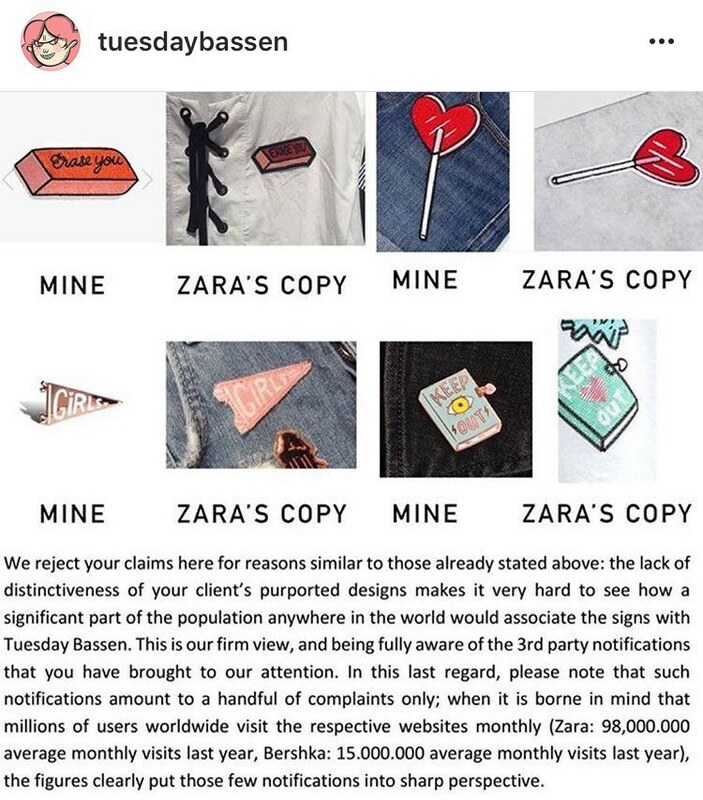 After contacting Zara, she received only a demeaning response from the company that attempted to invalidate the effort and creativity she had put into creating the original designs: “The lack of distinctiveness of your client’s purported designs makes it very hard to see how a significant part of the population anywhere in the world associate the signs with Tuesday Bassen.” The copied items are currently suspended from sale while Inditex, Zara’s parent company, investigates the situation. This is not the only instance of the Spanish clothing brand stealing designs from independent artists. 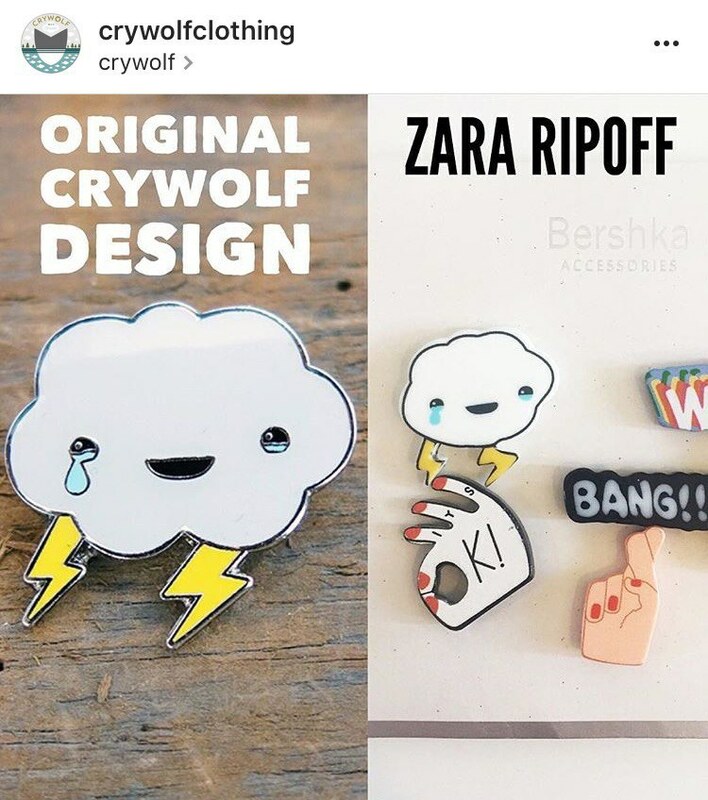 After Bassen’s claim of Zara’s plagiarism, the owners of the Canadian boutique Crywolf came forward with a similar accusation by posting an Instagram photo of their “Healing Cloud” pin alongside a photo of a nearly identical pin sold by Zara. Zara is certainly not the only large fashion brand whose obviously plagiarized and sometimes poorly reproduced versions of small artists’ designs have been exposed in recent years. 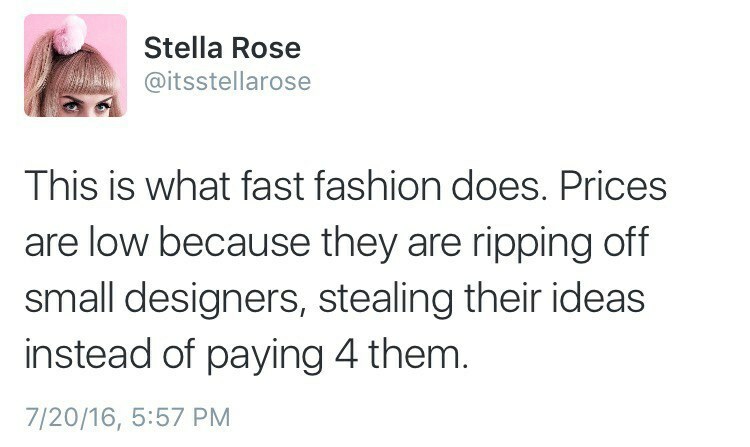 Forever 21, the American fashion retailer that brings in over $4 billion in sales yearly, is a repeat offender. In 2013, Forever 21 released a men’s shirt featuring an image of a figure looking up at an etched mountain, reading “You can conquer anything” — an illustration which artist Kelly Bastow had posted on her Tumblr account the year before. When Bastow contacted Forever 21’s complaint center, the retailer was quick to blame their vendors, stating that the “tee was purchased from a third party vendor.” New York artist Jon Contino experienced a similar case in 2012, when a friend sent him a photo of a Forever 21 tank top featuring a very familiar anchor design, which was quickly removed from the store’s website. 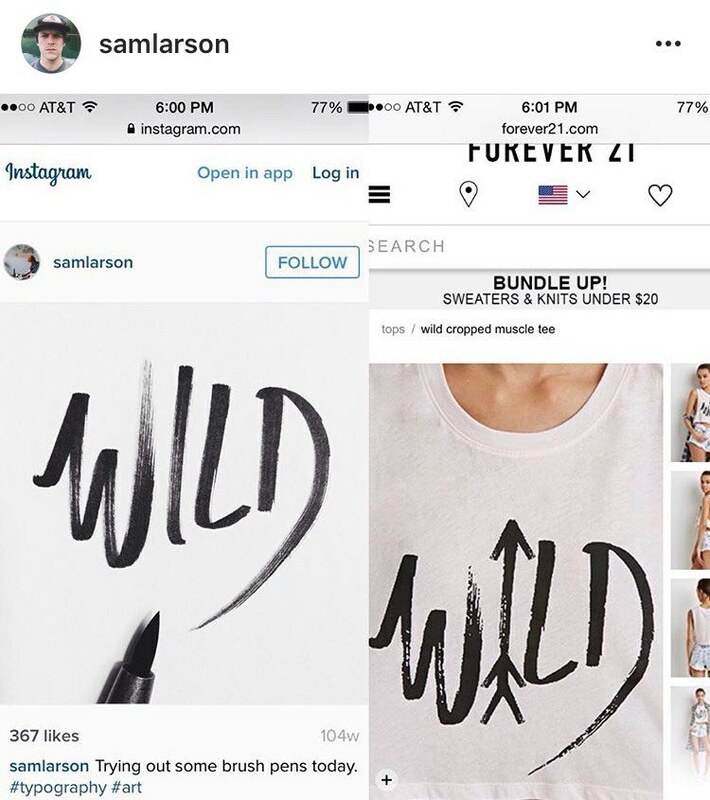 Also among Forever 21’s accusers is Sam Larson, a freelance artist from Portland, Oregon whose Instagram post of a crop top featuring his art caused an outpour of tweets under the hashtag “#paysamlarson. Urban Outfitters is also notorious for art theft, as full-time Etsy jewelry seller Stevie Koerner found out in 2011 when replicas of her “A World Of Love” state pendants began popping up in Urban Outfitters stores. Urban responded by claiming that the fact that so many identical pieces exist on Etsy proves that “the idea is not unique to Koerner and she can in no way claim to be its originator.” Three years later, James Soares, who sells art prints on the website Society6, claimed on his Tumblr account that one of his original patterns had been ripped off and sold on a miniskirt at Urban Outfitters (another claim that was met by the piece in question being removed almost immediately from the brand’s website.) The social media attention these and a number of other cases have brought to Urban Outfitters’ plagiarizing tendency inspired the creation of the Tumblr account Boycott Urban Outfitters, and a popular hashtag of the same name, dedicated to exposing the company’s art theft and encouraging readers not to shop there. In an age where every lie, cover up, or false move can be quickly unearthed and spread by social media detectives, it is no surprise that large clothing brands are having a hard time getting away with blatantly ripping off designs without sparking internet outrage, news stories, celebrity statements, and even the creation of a website entirely dedicated to raising awareness of and supporting arts affected by art theft, started by an artist whose drawings have been stolen from the retailer in the past. So why do so many well-known brands continue to swipe designs, despite the mess of bad PR that is guaranteed to follow? Because they are able to avoid paying for the use of art that has already received a positive response (albeit from a much smaller audience), and there is nothing that lesser-known independent artists can do to stop them. According to lawyer Leila Amineddoleh, who specializes in copyright law, it is hard for independent artists to pursue these types of cases in court, as “pursuing these lawsuits is very costly and a lot of artists can’t afford to go through with them.” By stealing artwork, brands show a blatant disregard for artists who depend on their own creativity, talent, and hard work to support themselves. Artists can only hope that in the future, major fashion brands will be held accountable for their plagiarism (or even better, show a sense of morality and respect for artists by stopping the theft altogether). For the time being, support independent artists by buying products on Etsy and from www.stoparttheft.com, and from the artists mentioned in this article, whose websites are linked under each of their names.